A prototype carbon nanotube "knife" has been developed on the same basic principle as a wire cheese slicer. The device stretches an individual nanotube between two tungsten needles, which is then pulled through a suitably soft sample. "We stretched an individual nanotube between two tungsten needles in a manner that allowed us to test the mechanical strength of assembled device" Gurpreet Singh tells Nanowerk. "A force test on the prototype nanoknife indicated that failure was at the weld while the CNT was unaffected by the force we applied. In situ load tests on the nanoknife indicated maximum breaking force to be in micro Newton range." Singh, a postdoctoral associate at the Nanoscale Characterization and Fabrication Laboratory at Virginia Tech's Institute for Critical Technology and Applied Science(ICTAS), is first author of a recent paper in Nanotechnology that demonstrates the fabrication and characterization of a carbon nanotube-based nanoknife. Singh explains that, in biotechnology and medical studies, the three-dimensional cryo-electron microscopy of frozen–hydrated samples is important for structural and functional studies of cells. "An intrinsic problem to cutting sections of frozen–hydrated samples with conventional diamond or glass knives is that the angle included at the knife’s cutting edge bends the sections sharply away from the block face, inducing compressive stresses on the upper surface of the section relative to the bottom, which leads to cracking of the sample surface when it is laid flat," he says. 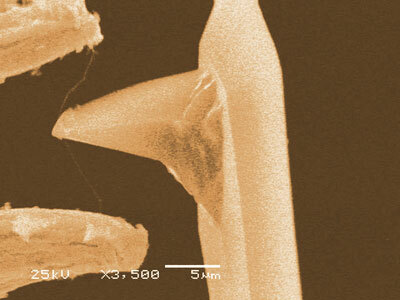 "A possible solution to this problem is to use a multi- walled carbon nanotube in place of a conventional diamond knife. This device would reduce the angle by which the sample is bent during cutting, due to the small diameter of a carbon nanotube." ...a tightly strung metal wire is an effective cutting tool, so long as the wire and its support are strong and the material is not too hard (think cheese). "One can imagine that CNTs could cut vitreous water, vitrified cells, and other comparatively soft materials in the same way" says Singh. "Maybe, one day, similar devices might even be used for nanosurgery." "So you do have an invisible wire. Clever - but what use is it, except for parlor tricks?" 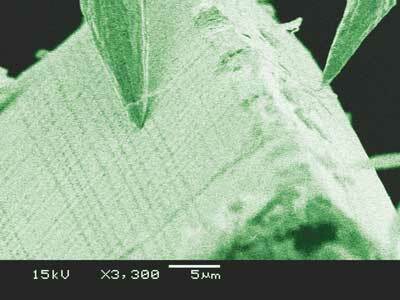 "The reason you can't see it is this sample is only a few microns thick. Much thinner than a spider's web... it's a continuous pseudo-one-dimensional diamond crystal..."
"Fascinating," whispered Rajasinghe, almost to himself. He gave little tugs on the ring hooked around his finger, to test that the tension was still there and that he was not hallucinating. "I can appreciate that this may have all sorts of technical applications. It would make a splendid cheese cutter." From Nanowerk. Also, for those who are mystified by the cheese slicer analogy, here's a wire cheese slicer video.